ON YOUR MARKS – JET – SET – WILLY! Just in case you’re a visitor from another galaxy, have discovered the world of 8-bitters just recently, or have been on a platform the game never made it to: Jet Set Willy is a part of the 8-bit family jewels. It’s a sequel to Manic Miner, also an outstanding game where Willy the miner must escape a complex of caverns filled with such grave dangers as mutant telephones or an alien kong beast. Anyone who’s ever played Jet Set Willy knows that it’s not an easy game. After Willy escaped the mines, he threw a wild party in his new house. The house is not only new but also huge, so when Willy’s annoyed wife Maria tells him in the morning she won’t let him enter the bedroom until he tidies up the whole house, there are more than sixty (!) rooms waiting to be put back into order. In the beginning it might look like Willy’s got enough time for the cleaning job (from 7 a.m. to midnight), but there’s more to the house than meets the eye. Like that there’s an item in one of the rooms (Conservatory Roof) that you can’t collect without losing a life? Or that the game looks different on different 8-bitters? Let’s have a closer look at some of the trivia around the game. The original release of the game had a fatal bug. Once you visited the room called The Attic, you couldn’t enter some rooms (like The Kitchen or The Attic itself) anymore. If you did, some mysterious power kept killing you there until you ran out of lives. Software Projects, the game’s publisher, were neither the first nor the last to try the stupidest excuse of them all: “It’s not a bug, it’s a feature!” They said that visiting in The Attic caused some of the gas pipes in the house to break and the corrupted rooms therefore contained poisonous air. This naive “explanation”, however, wasn’t enough, and Software Projects had to release an official set of POKEs that fixed this bug and several others that had transpired in the meantime. Apart from some invisible objects, which you acquired by just visiting certain rooms (e.g., Swimming Pool), there was also one that couldn’t be collected. Originally, it was located in First Landing, just next to the top of the blinking cross. Not only you couldn’t see it, but you couldn’t even reach it. So a fix was published that kept the item on the same screen coordinates but moved it to The Hall, whose layout made it possible for Willy to get it. This room isn’t bugged, just insanely difficult. To cross it, you have to jump over four monsters whose paths mutually cross, so you have to plan your way carefully and be almost pixel-exact while jumping over them. From certain rooms you can take shortcuts from completely different parts of the house. Usually, it is done through exiting the room in the “up” direction, like in Watch Tower, where jumping up from the conveyor belt on its top gets you to The Off Licence. Likewise, if you jump up from the conveyor belt in Rescue Esmeralda, you’ll find yourself in Ballroom East. 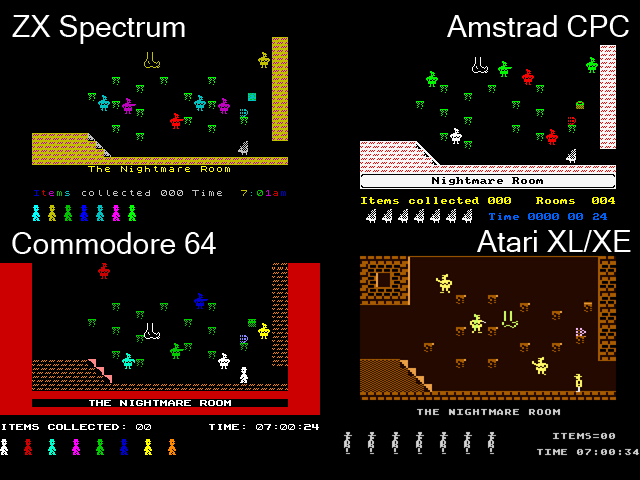 Even though the 1980s were the idyllic time when games usually just worked, the curse of The Attic Bug seemed to affect also the ports of the game to the other major platforms. The C=64 version by Shahid Ahmad was also bugged. Perhaps the biggest problem is that Willy’s jumps to the left and to the right are of different heights (and, consequently, lengths). It’s a matter of just a few pixels but prevents you from completing the game. That every stair in the house is about waist-high and Willy looks like strangely levitating when climbing them is then just an insignificant detail. The translation to the 8-bit Atari by Tynesoft, however, was even worse. I could throw a lot of funny adjectives at the graphics, animations, and mechanics of this totally unplayable disaster of a game, but I’ll just refer you to the screenshot above instead. If it wasn’t for Rob Hubbard’s music, there would be no reason to load this version even once. Note: The Tynesoft version shouldn’t be confused with Jet Set Willy 2007, a fan port of the game to the Atari 8-bit, which in turn is perhaps the most faithful conversion from the ZX Spectrum, Willy’s home platform, to any other 8-bit computer. But Willy’s journey around the 8-bit world will be the subject of a different article that we’ll publish in near future. In The Nightmare Room, Willy transforms into a winged pig. Some sources call it a flying hedgehog. I’ll leave it up to you to decide. 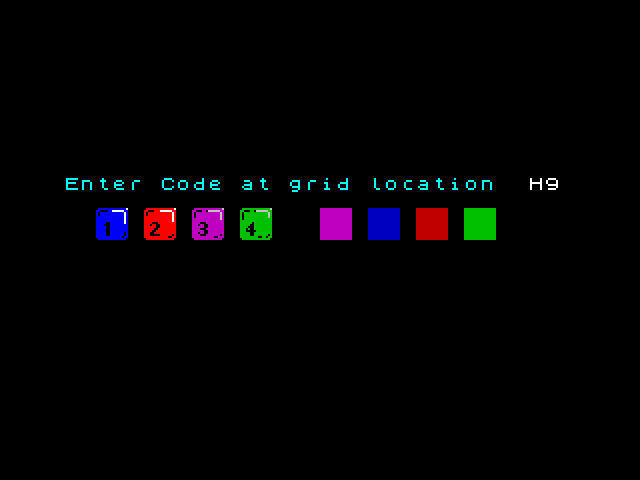 This feature is missing from the Atari and C=64 versions, while on the Amstrad CPC, the joke is applied even to the lives display at the bottom of the screen. On the screen called The Banyan Tree, there’s a wall that makes it impossible to jump through the tree’s roots and get to A bit of tree (capitalization – or rather the lack thereof – as opposed to most other rooms, in the original). The wall has to be removed by one of the aforementioned POKEs. While in most rooms you have to be very cautious not to collide with any of the baddies and plan your way and jumps well in advance, in The Kitchen and West of Kitchen you can avoid the flying killer cooks by just blindly walk left all the time. For those of you who have played the game as kids, this will be nothing new because we all have always played only legally bought games (right?! ), but anyway… The game was one of the first to come with a special form of copy protection: once you loaded Jet Set Willy, you had to enter a 4-digit, color-based code that you had to look up in a matrix printed on the original cassette’s inlay. If you got the code wrong the first time, the game asked for a code from another square from the matrix. If you failed two attempts in a row, the computer reset and you had to load the game again. Willy’s mansion, or rather manor, comes with all kinds of expected and unexpected rooms. Apart from the Master Bedroom (about which the whole game is), Willy has his own yacht as well as a watchtower and battlements, an emergency generator, or a chapel. There are much more obscure rooms as well: one’s called We must perform a Quirkafleeg, others have names like Dr. Jones will never believe this, or I’m sure I’ve seen this before.. (“Honey, could you please bring me my curlers from wemustperformaquirkafleeg? If they’re not there, then I must have left them in I’msureI’veseenthisbefore.. or in Dr.Joneswillneverbelievethis.”) There’s also a priests’ hole – whatever it is – and even an entrance to Hades! Here’s map of the game. The game is so unique and the house so big that it almost begs for you telling your own stories. So when you know Jet Set Willy in and out, you can invent your own little games. What would happen if Willy just disobeyed his bossy wife and do the exact opposite of what’s asked of him? How many rooms could you visit not collecting a single one item? Or what if you just acted out a real-life scenario and instead of tidying up after the party immediately you just holed up somewhere and slept out of your hangover? For example, you could enjoy a nice nap in the branches of the tree in the Out on a limb room and, as a matter of principle, not to collect a single one item on the way. You can go through The Bathroom, Top Landing, First Landing, Main Starway, The Kitchen, and West of Kitchen, then through Cold Store and Back Stairway to The Wine Cellar. There you have to cross The Forgotten Abbey, The Security Guard, and Under the Drive. From there you’ll go to At the Foot of the MegaTree you’ll just jump through Inside the MegaTrunk to the Tree Top and Out on a limb, where Maria will never find you. You will not officially win the game this way, but you have not collected a heap of the things and can enjoy that priceless, heartwarming feeling of outsmarting the old witch in the bedroom. Or you can use one of the shortcuts – from the Back Stairway you can climb up to the roof and in We must perform a Quirkafleeg you climb up the rope to the Watch Tower. Once there, jump over the left obstacle, carefully avoiding the item on its top. Then go to the conveyor belt and jump up. Voila, you’re in The Off Licence, from where you’ll just go on to the left to the MegaTree. Or just don’t care about my advice and get a bottle or five in The Off Licence. That’s a nice revenge too and gives you the sweet satisfaction of playing according to your own rules. Either way, I heartily recommend you to stop reading and just load the game and enjoy it yourself. On your marks – Jet Set – Willy! http://8bitstuff.com/wp-content/uploads/2017/05/title2.png 591 640 akiotenshi http://8bitstuff.com/wp-content/uploads/2017/11/napis-gimp4new.png akiotenshi2017-11-01 14:45:122017-11-17 17:45:24ON YOUR MARKS - JET - SET - WILLY!